1.Intermittent problem with Lincoln key FOB. Suspected Door Module. 2.Service dept took my call and recorded the problem as I described it. 3.Appointment was delayed until such time as problem was evident. 4. Entered Service Dept and was interviewed by Robbie in 5 minutes. 5. He confirmed what I said on the phone, typed out a work order, 6. I added fix anything that is found on warranty. 7. He confirmed the validity of the warranty and gave me a slips for a car rental. 8. I received a call the car was fixed that afternoon and picked the car up the following morning. 9.. I choose Ocean Park which were further away than other dealers because the initial call was receptive with a willingness to help treating me as a customer and not another number. 10. There is a sign in the Service department saying if your unhappy the owner will gladly listen to your complaint. I have had my 2014 Ford Explorer serviced there since I bought it from OPF and Don in sales, an overall great experience. I traded in my 2010 F150 that I purchased there from Don as well, so going back there seemed to be a natural. I was happy with the trade in value of the F150. 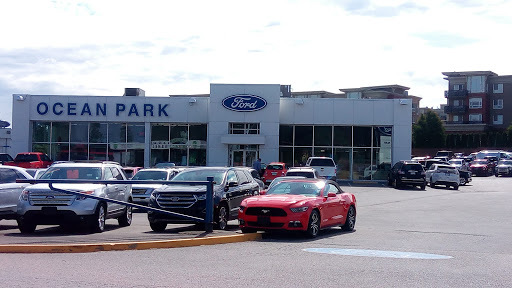 and I have had both of these vehicles serviced at Ocean Park Ford on a service contract, which was not available when my wife purchased her 2014 Honda CRV from just up the road, which did not make me happy, but back to the service dept. they are exceptional in customer service, and always offer me a ride home and a pick up from my home when my vehicle is ready to go, and their estimated completion times are always accurate. Overall a great experience. I would recommend the sales and service dept, to anyone who is looking for a vehicle. or just great service. I am young but drive a 2014 Ford F-150 limited because I work hard, I dealt with Robert Armstrong from ocean park ford, the sales person did not want to give me final price on a 2016 ford f150 limited and this should be straight forward as I got x plan,when I asked him to appraise my 2014 limited he said I dont want to waste my sales managers time if you are not genuine I cant work on it, I told him I wouldnt be visiting if I dont want the truck. Robert then asked if I want to test drive it and I said yes, he drove up with a beat up 2014 limited just the same as my truck but in white, I said I want to drive the 2016 brand new one and whats the point on buying the same truck as mine with more kms ? He said oh its the same thing... Robert Armstong I might be young but not stupid... I understand trucks better than you. Bought my truck back in May from Jeff, I had great service from everyone. I didnt qualify at first for financing and they managed to pull strings and get it for me as I was new to "credit". I love my truck and will definitely be going back when I upgrade in a few years. Second I had a small issue with the radio and the service department was quick to help and I dropped my truck off and they drove me to work so I wasnt waiting around and missing a day of work for them to diagnose my truck, they figured it out that day and replaced the park the next week when the part arrived. If you are looking at buying a new car or truck I would highly recommend these guys at ocean park Ford, go see Jeff and he will take care of you!